Irabu, actually Erabu Sea Snake, it’s about 70 – 150cm long, and dark bluish in color. Its body is marked with black stripes, and they could live even on dry land. Although they are highly venomous creatures, they have very calm character and are easy to catch. Okinawans have been eating Irabu soup since the times of the Ryukyu Kingdom, and those days it was considered a very high-class dish. For making the soup, Irabu are first smoked fresh, and then reconstituted by immersing in water. It is said that the soup is an effective anti aging remedy, lowers blood pressure and fever, and is nourishing to body. 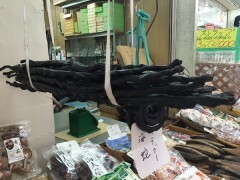 Smoked Irabu are sold at Kousetsu Ichiba (market) in Naha city.